We welcome Mai and Gary as the new managers of the cafe at our Ballarat venue. Mai’s Kitchen Rules Cafe is open 7 days a week from 10am. Mai comes from a Vietnamese background and brings years of cooking knowledge and an Asian flare to the new menu. Offering a few of the old favourites, along with some new dishes and delicious daily specials. 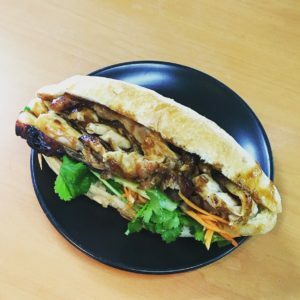 Mai is quickly becoming known by not just the stall holders but also our customers for her tasty Bahnmi Pork and Chicken Rolls. Served with special sauce, coriander, fresh onion, pickled carrot and cucumber. The tasty aromas of which now fill the building. Be sure to pop in soon and say ‘Hello’ to Mai and her team.